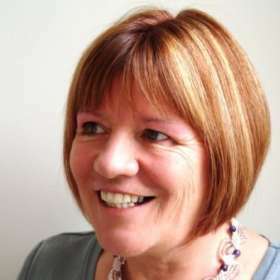 I finally decided what to make my mum for her 70th birthday. 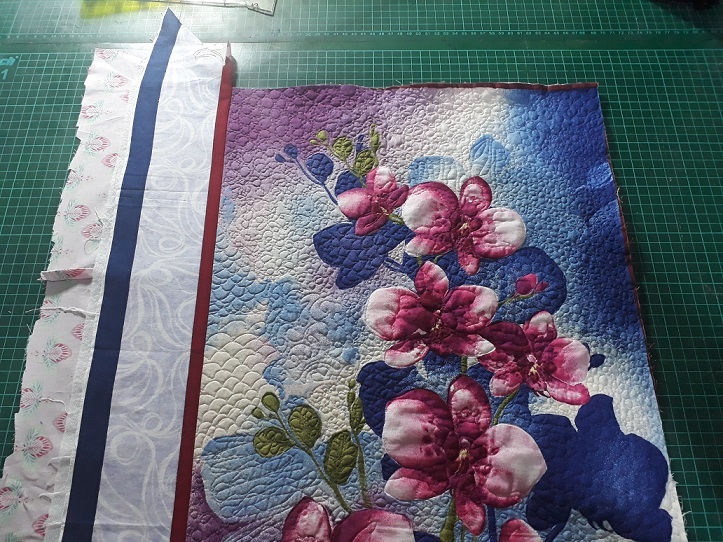 I ran out of time to get a big quilt done (and I’m still working on Xander’s from 2 years ago…) but I found this gorgeous Bernatex orchid panel on our Facebook destash page. It’s a bit wonky but that happens sometimes, fabrics can be printed with errors or not along the grain. If you’ve ever tried to deal with a check fabric that’s not printed straight you’ll understand. Unless I have to, I’ll always avoid checks now in my quilting. I started by quilting the centre… I used invisible thread because my Pfaff Performance 5.0 far prefers it. It’s really hard to see where you’ve already quilted though on the pale bits. 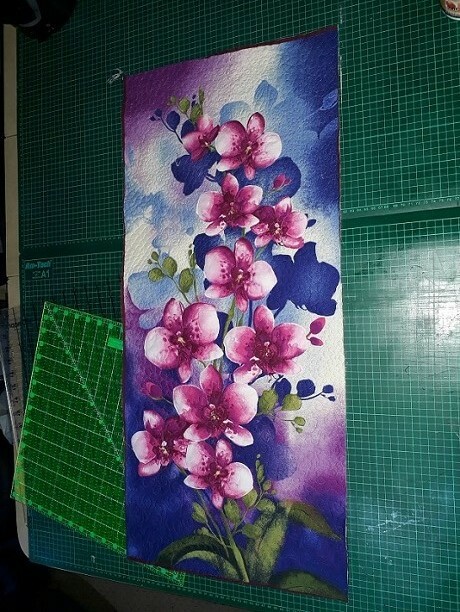 I did all of it densely except the flowers, the whites of the petals are not quilted to make them stand out a little. Oh no, the borders are so wiggly! Densely quilting the centre has reduced the overall size by about an inch and a half. Densely quilting the borders too would use up all that wiggle, but I wanted to just follow the ribbon swirls in the borders. Plus the panel is wonky so I’m going to do something drastic…. I started by cutting the borders off along the red line, cutting the corners as mitres to keep the dark blue border. 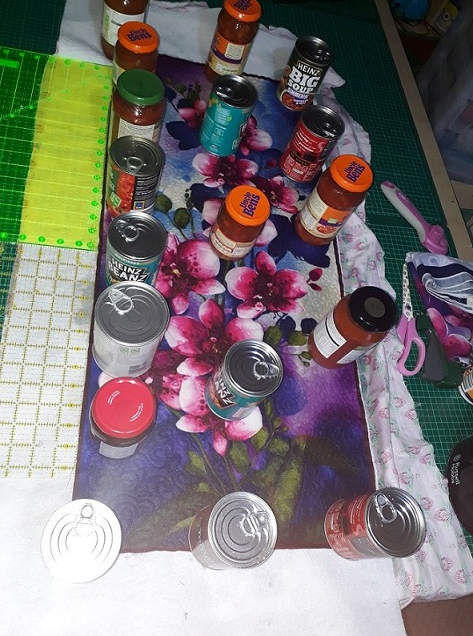 Next was to straighten the panel which I did by blocking it – dampening the panel and then using lots of heavy things to make it dry straighter. I did have to do a little trimming after but I’m quite pleased with it. I’ve never blocked anything before, I probably made it a bit too wet, it took three days to dry, but it worked so what the heck. Now I need to rejoin the borders! 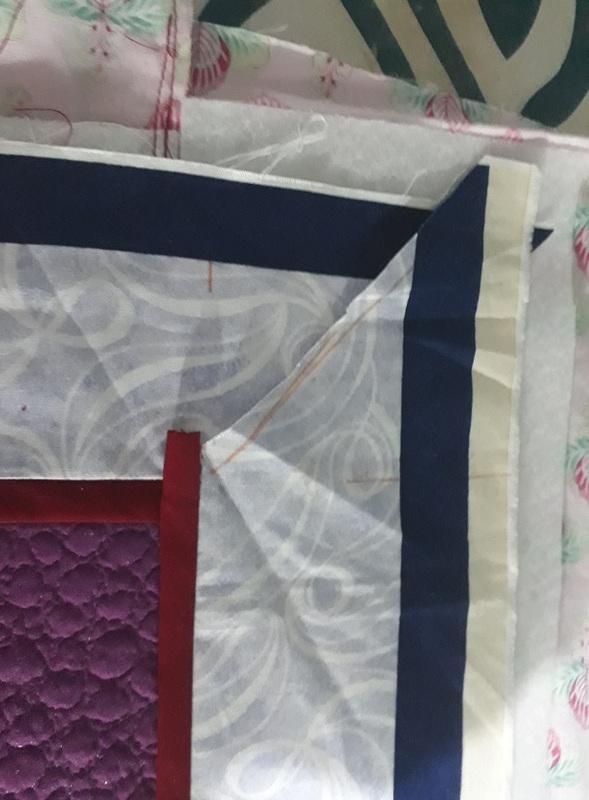 I did like that burgundy-red little border so I found an identical colour (when you have too much stash that kind of thing happen a lot  ) and cut some 1″ strips to replace it. The border would come out wider but 3/4″ would have been harder to attach. I attached the red strip to the detached borders and laid them right-sides-together on top, and some backing fabric r-s-t on the back, and sewed them both on at the same time. I ironed them and slotted some batting in between, butting it up so there wouldn’t be any gaps. Looks perfect! Urk, you can see my freemotion quilting really well there, don’t look too hard! I’m definitely a beginner, I tried a few patterns but I followed the fabric design. 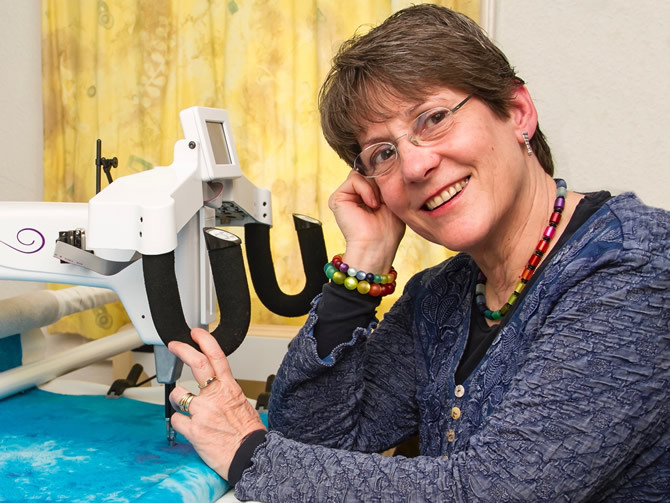 At the Festival of Quilts in 2018 I met a lovely lady called Hilde Van Schaardenburg who is a quilt artist and judge. 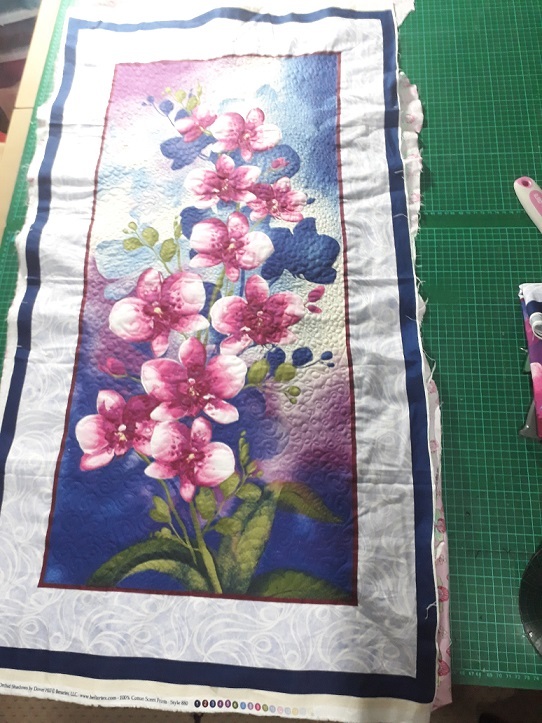 After explaining this to Hilde, she suggested I try freemotion on patterned fabrics instead or batiks and follow what I can see on the fabric rather than guessing where to go. It worked really well, I finally had a design to follow! There may have been tears, it was a very emotional moment. She gave me a signed copy of her book and some fabric to practise on too. I need a lot of practise, a LOT of practise but it’s a step firmly in the right direction. 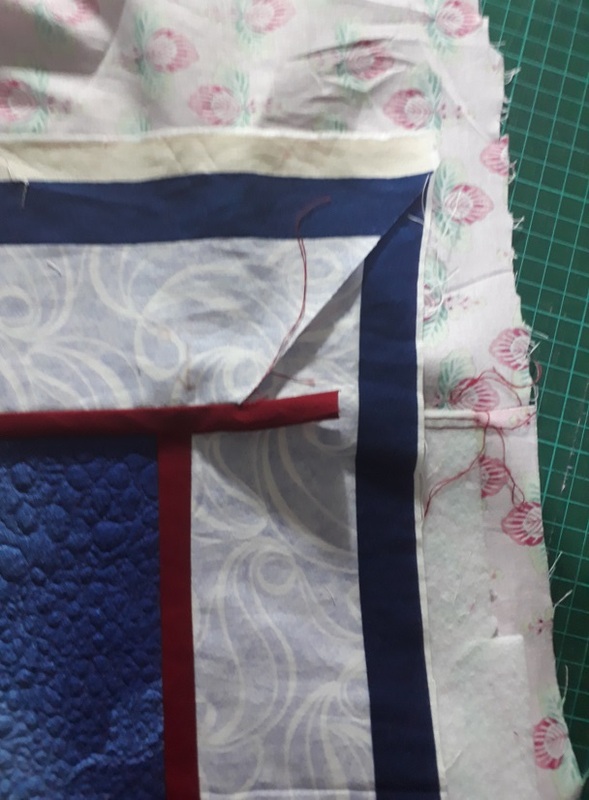 Back to the panel, I attached all four sides and totally cheated on the corners, I simply marked where the mitre should be and folded the top edge under and pressed it. A little handstitching and no one would ever know. Actually I might do all my mitres like that from now on, it was certainly easier. 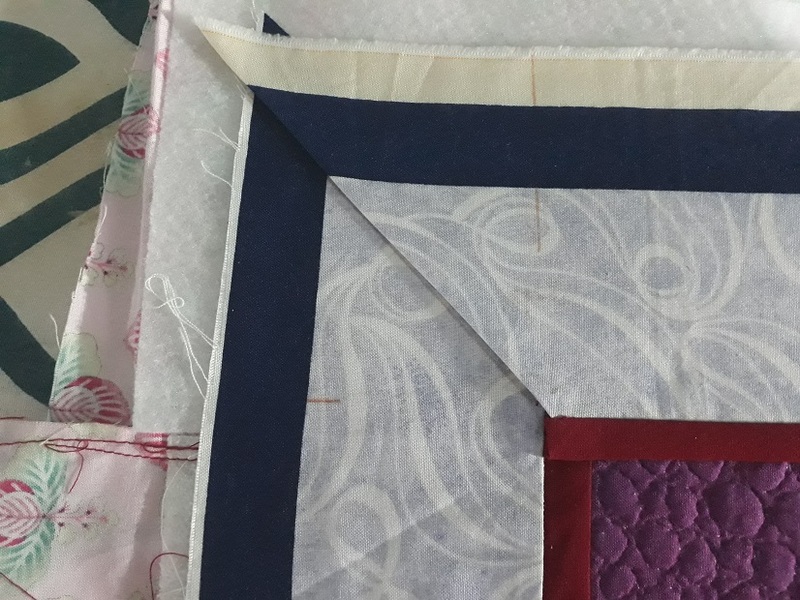 I freemotioned along the ribbon pattern in the border, a red binding and it was done! It was a lot of work for a little panel, but the time taken to straighten it and re-attach the borders was well worth it. I put a hanging sleeve on and a label of course. The red binding does something different to it, it’s a lot brighter than the original panel now. I have a second identical panel, perhaps I’ll bind that one with blue and see what that does to it. When I get round to it! Tahdah. Happy 70th Birthday Mum, I hope she likes it!